Today I am happy to release my new song “Rain Clouds”. This track was recently recorded along with several others, planned to be included on a longer release later this year. “Rain Clouds” and all the other songs were played and sung live, twice. Then either the best take was used or they were both blended together. “Rain Clouds” is currently available on BandCamp in a “pay what you want” model. If you want to pay for it you can, if not that’s okay too. I’d just love for you to hear it. I hope you are doing well. I wanted to send you a quick note to share with you what’s been going on lately. It’s been a very good start to this new year. Beginning sometime early last year I began to feel the Universe pulling me in a new, yet familiar direction. It’s nice to have my old friend visit again as it’s been nearly a decade since the last. During that last visit – which happened around the middle of 2008, the Universe asked/commanded me to stop everything I was doing and change my life, alter the way I did things and relocate to a new state. I made these changes happily and began what has been one of the most magnificent journeys of my life – one that I have learned from and enjoyed very much. Not only that, I am certain it saved my life. Now it seems it’s time to begin a new/old journey again. But this time I enter the familiar arena armed with new insights and lessons I have learned. Most importantly I’ve grown much wiser and much less desperate for things to come to an early end. Today I feel much looser than I have in ages. Creativity blows like wind through nearly every thought and every hour of the day. It’s a welcome change too – as the tightly wound knot that has held me together through these years of re-education was beginning to cut off my circulation. I am reminded of how it felt to be a very young person, discovering the beauty and strangeness of life for the first time. Only now I have experience – and won’t be caught off guard by the darkness that is a part of every wonderful thing. I would like to share with you some of the things that I have found and am still finding that have helped along the way. So please keep an eye open for them in the near future. I’m sitting on my couch, looking at the screen and trying to think of a good opening line to start this post with. I guess this will have to do. I know it’s been a bit since I’ve posted here and that is because lately I’ve been writing and playing music like a madman. The work has resulted in about two dozen great songs. So time well spent. I have just returned home from a great trip to Oklahoma to play an acoustic set with the guys from Rusted Root. The whole thing happened pretty fast. I sent my friend Donnie (a concert promoter in Oklahoma) a message that I was ready to play shows again. About 50 hours later I was on a plane, headed to the midwest to play a set opening for the guys from Rusted Root. I didn’t want to travel with a guitar so as soon as I landed I headed over to Black Bird on Pearl to borrow a classical acoustic guitar from my friend Steve Liddell. The next morning Guitar House of Tulsa was kind enough to loan me another one so I was all set for the show. The whole experience was a blast. I played 45 minutes of brand new songs that are some of the most haunting, sad and pretty tunes I’ve ever heard. It was the first time I’ve played them anywhere and I think they went well. It felt so great to hear my guitar and voice oozing through a big PA system again. I’ve gotten so used to the sound of me singing without amplification and it took a few minutes to get used to it again. But after those few minutes, it was heaven. I’ve come for your tears. The next night I ended up being part of an impromptu living room concert with some of my oldest and best friends. We moved some furniture, setup guitars, amps and microphones and played for four or five hours until we were all ready to pass out. I haven’t had that much fun for ages! It was so fun to get back home and see some old friends and family. I can’t wait to do it again and I will be back soon. Most of us wake up in the morning and don’t want to get out of bed. Maybe we stayed up too late, maybe we partied too hard, maybe we lay in bed all night stressing over ever detail in our lives from birth to now. By the time morning rolls around you might not feel much like getting out of bed at all. But unless you’re independently wealthy and have accomplished every dream in your life, you’ve gotta get up and make things happen. 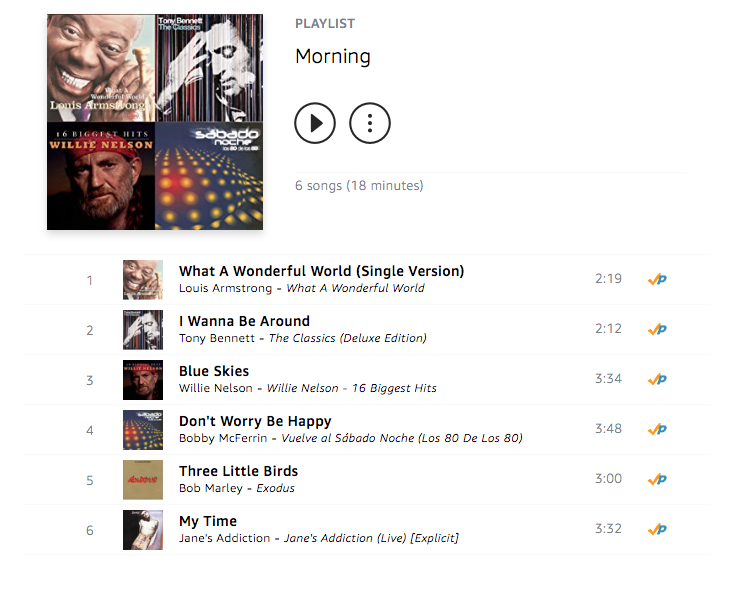 I’m going to share how I am making my morning’s better with a simple playlist of songs. After my recent move from the city to the woods I started trying many different ways to make myself feel better. One thing I did was play around with my morning routine. I remember reading somewhere that a good way to wake yourself up is to go outside first thing in the morning, wearing as little clothing as possible and move around while soaking up some sun. Another recommendation was not looking at your phone, staying out of your email, not checking social media or reading the news. So I put the two together. Each morning I waited for the sun to shine on my patio. Next, I’d grab a cup of coffee, go outside and stand in the sun and do some moving/stretching for ten minutes to wake myself up. As it turns out – ten minutes is a long time to stand outside and do nothing. So one morning I decided to put on some music while I was out there to make it more fun. It definitely helped, but some of the songs weren’t quite what you want to hear first thing in the morning. Don’t get me wrong, I love Elliot Smith and The Cure but melancholy music first thing in the morning isn’t really going to get me pumped up for the day. And the Malan D Morning Music Playlist 2018 was born. The first version of my morning music playlist only had three songs on it. They were about three minutes each and I used it to track my ten minutes outside every day. But over time – the list has grown and now I spend somewhere between 15–30 minutes outside every morning and it’s f#cking beautiful. Instead of reading the horrible news of the day and getting sucked into Facebook drama I’m outside in as little clothing as possible, soaking up some vitamin D, looking at the sky, watching birds fly by and doing my best to get myself primed for a great day. For a maniac like me – it’s a great way to start the day. I’ve rarely missed a morning since I started and when I do, I realize it, put on the playlist and run outside to feel great. If you’ve never tried something like this, you should. Here is the track listing, in order. I’m using Amazon Music. But you can make yours on YouTube, iTunes, Spotify or whatever you use for music. Should you give this a try? If you’re anything like me and your default feeling is “miserable” then the answer is hell yes. Start with my playlist and see how it goes. If you need to, edit the playlist and make it your own using songs that make you feel happy and good. Then, play every. damn. morning. It’s a stupid little thing that helps me a lot. And I hope it helps you too. Over the last year or so I’ve been reconnecting with people from Oklahoma. Some who I haven’t talked to much since I left town. One conversation was with a sweet heart of a girl named Jenn, a friend from Tulsa who was a fan of our band Rewake. She mentioned she had a copy of our albums ‘Air Bubbles’ and the ‘Bohemian Dream EP’. I hadn’t listened to either of these much since I moved away. Everytime I tried to, I’d have a very slight panic attack and turn it off. The music sounded fine, but it sent me back to a time and place that was fun, exciting and creative but also dark and depressing as hell. But this time I listened and that didn’t happen. I played the entire Air Bubbles album and then the Bohemian Dream EP back to back. I danced around my house by myself, live streaming some of it to my Instagram story. And for the first time ever – I was able to hear our music as a fan and not as a member of the band. And there’s a big difference. When you listen to a band you love, you just hear the song and have a great time. But when you listen to a song that you played on, all you hear are the mistakes, the production problems and a word or chord you think should have been different. I get asked all the time if these albums can be purchased online and unfortunately they never made it to Itunes or Spotify. So I normally just tell people “Nope”. I had such a great time listening to these two recordings, that I decided to get them digitized and online. This way, when someone asks, I can just send them a link and they can have a good time too. So if you were around in those days and have been wanting to hear either Air Bubbles or the Bohemian Dream EP again, now you can. And if you weren’t around for it – you can check it out for the first time. Just go to http://rewake.com or http://rewake.bandcamp.com. And if you have time, come back and lemme know what you think. P.S. If you have a digital copy of our first live CD ‘Foreign’ or any of our other live shows, please contact me and I’ll put them online as well. I don’t have a CD player to rip them.